Can I Send You Some Pink Slips To Hand Out? I’ve thought about this for a few years… last week I sent my first batch of Pink Slip cards to an evangelist as a “thank you” for something. Don’t know what I’m talking about? Here’s a post from October 2010 where I talk about how awesome they are. Not to brag, but … well, okay I’m bragging. Yes, I’m bragging. This is one of my most brilliant ideas (I’ve only implemented a few of the brilliant ideas). Why? Because as I’ve travelled the country speaking I’ve left thousands of pink slips with people who wanted stacks of them to hand out. People asked me to hand out my marketing tools. They wanted to. It is fun, and you can get a fun reaction from people when you give them one. Some people took a few, others took dozens. In cities like Baltimore, McLean (and surrouding cities), Phoenix, the Silicon Valley area, Minneapolis and more I’ve had my evangelists giggle and hand out my Pink Slips. I’ve only done that when I’ve spoken, but this year I’ve taken on less speaking and more projects from The International JibberJobber Headquarters, which means I have a bunch of cards in my closet. And I want to get them out on the street, where they belong. Can I send you some pink slips? If so, please use the Contact Us form and I’ll mail you about 20. And if you want more, I’ll send more. There is no charge for this. Have fun, give them out, and I thank you in advance for helping me get the word out about JibberJobber. 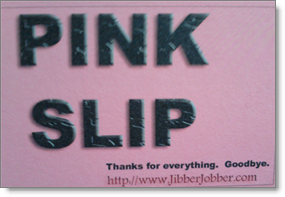 Click here to ask for your Pink Slip cards… make sure I have your mailing address! Comments Off on Can I Send You Some Pink Slips To Hand Out?